Who says you can never go home again – especially when it seemed as though you burned every bridge on your way out? 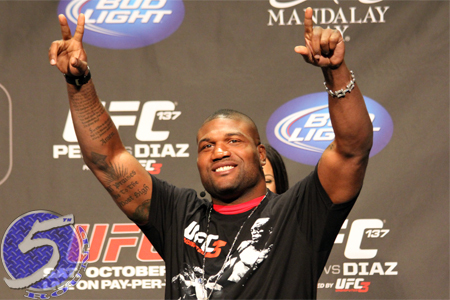 Well, it appears former UFC light heavyweight champion Quinton “Rampage” Jackson (pictured) has re-signed with the UFC. The planet’s premier mixed martial arts promotion made the announcement during Saturday’s UFC Fight Night 58 event in Brazil. Jackson essentially completed his contractual obligations with the UFC following January 2013’s unanimous decision defeat to Glover Teixeira. Although there was some fine print at the bottom of his contract that allowed the UFC to match any offer that came across his table, they opted to part ways because of the disrespectful comments he made leading up to his final Octagon fights. Like many others, Jackson complained of disrespect, low pay and under appreciation. The 36-year-old then signed with Bellator MMA and TNA Impact Wrestling. Although his professional wrestling career was short-lived, Jackson went 3-0 for Bellator. Here’s where things get sticky, Jackson inked a multi-year deal with Bellator. While he has been griping about Bellator ever since former president and Jackson advocate Bjorn Rebney was fired, various outlets have confirmed he’s still under contract with Bellator. It will be interesting to see how this plays out. Jackson was last seen in May posting a unanimous decision victory over Muhammed “King Mo” Lawal. He owns a 35-11 professional record. Jackson is hoping to fight in the first quarter of 2015, but his Bellator contract situation might be a major roadblock.